Your recreational vehicle can be considered as your second home. You can fill it with almost all of the modern conveniences that are also present in your household. For most RV enthusiasts, they even consider it as a modern hotel room on wheels, which contains almost all the things they need to experience utmost comfort on the road. If you own a recreational vehicle and you want it to be as modern and complete as possible, then you would want to invest in the best RV shower head for it – that is the key to enjoying a great showering experience even if you are not at home. It should be noted that the shower head designed for RVs is a bit the same as the ones you often find in the bathrooms at home. However, note that the two differs in the sense that most shower heads for RVs are designed to consume less water while also being pressurized as a means of giving users the chance to experience a similar clean feeling without having to use a lot of water. Among the most famous brands of shower heads for RVs are Oxygenics and Ecocamel. Both the Ecocamel RV shower head and the ones offered by Oxygenics are built with quality in mind while also delivering a good water flow and pressure for the benefit of users. Before choosing, though, you have to compare Ecocamel vs Oxygenics so you will know which one will be able to provide you with ultimate satisfaction. Also, take note one common feature that you will see in the most reliable shower heads for RV is the shut-off valve, which works efficiently as far as conserving resources is concerned. If you are confused about the many shower head options that are laid out to potential buyers, then the top RV shower head 2018 and 2019 options indicated here will most likely guide you during the selection. 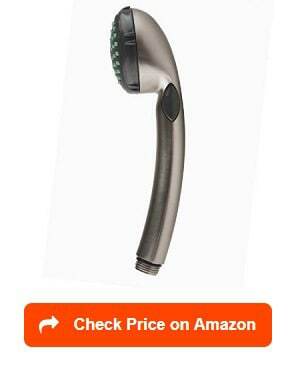 One major highlight of the ETL 26781 Body Spa Oxygenics Shower is its attractive handheld design. This design is enough to let you enjoy jet engine power once you are showering. One of its nicest features is the adjustable comfort control. This means that you can make adjustments on the level of comfort (for ex. soft or stimulating). It works based on a patented technology, which is effective in raising the content of the oxygen in the water. 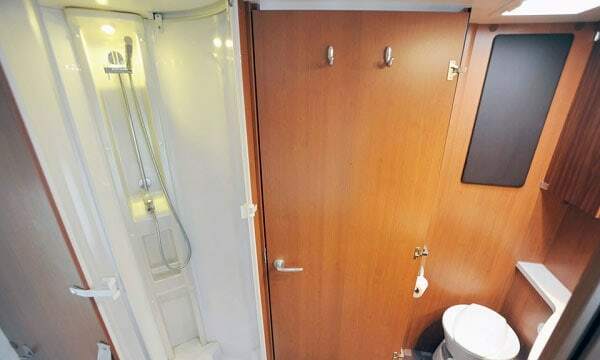 It can give you the best experience when showering in your RV’s bathroom with its self-pressurizing nature. It can deliver a really good pressure even if the water pump used in your RV is powered by a battery. With this product, even lower water pressure will feel much higher while still ensuring that there is a reduced flow rate as a means of conserving water. It also tends to perform what it is intended to do without the risk of clogging. In addition, it has most of the features necessary to make it work the way you want, including the wand, wand holder, 60-inch hose, washers, and comfort regulator. It even has installation instructions that are easy to follow. Your goal of utilizing the most reliable shower head is also possible with this RV shower kit offered by Oxygenics. It is created based on the Oxygenics technology unique to the brand, which works in amplifying the present water pressure. The technology also widens coverage, which makes it worth the money. It is also economical in the sense that it can lessen the use of water while also prolonging the water tank’s life. Another feature that you will see being incorporated into this RV shower kit is the SmartPause valve. This specific feature is a great addition to the kit as it tends to restrict water flow in case you are applying soap. The valve also ensures that the water temperature stays consistent. This results in a preserved level of tanks. You will also notice the special and unique spray pattern used in this product. It promotes speed in rinsing and washing, which is especially helpful in case your hair is long. The internal components of the shower kit are also proven to be non-stick. With that quality, you are assured of its ability to prevent clogging and the buildup of minerals. Installing it also takes just a few minutes, promoting convenience. 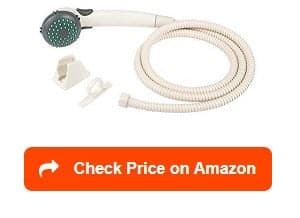 Several Oxygenics RV shower head reviews also state how beneficial this unit is. Another item that is worth your time checking out is this kit featured by the Dura Faucet brand. 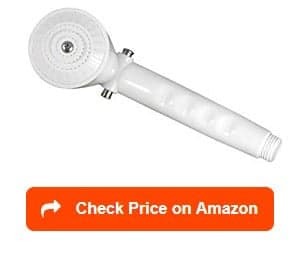 It works as the best RV shower head replacement not only for recreational vehicles but also for trailers, campers, and motorhomes. It is designed to satisfy you for quite a long time since it is composed of premium materials. These materials will not let you down as you can enjoy using them without interruption for several years. Your mind will also feel at ease regarding the durability of this kit as it is made using the lightweight yet premium-grade synthetic resin material. The fact that it is a universal shower head also means that it works in numerous applications. As far as its design is concerned, you will instantly notice the valve switch in the item, which actually aids in conserving and saving water. It is a convenient shower head kit as it also features a 60-inch hose already. In addition, a mounting bracket is around to guarantee ease in mounting and installing it. You will also be glad once you realize that it also features rubber seals and new hardware while also being easy to match in most parts of your vehicle. The ETL 26181, with its many valuable and functional features, is another of those shower heads for RVs guaranteed to provide a hundred percent user satisfaction. The manufacturers of this product make it a point to create it to apply jet engine power into your shower. It also comes with a handheld design, which ensures that users will not find it difficult to use. It is a self-pressurizing shower head, allowing you to enjoy showering each time. Also, it utilizes a patented technology, which main focus is to increase the content of oxygen in the water. Another positive point associated with this showerhead is its adjustable comfort control. This gives you full freedom as far as comfort level is concerned. It is even possible for you to adjust the comfort to either soft or stimulating. If you are worried about clogging, then the product can put your mind at ease since it is known to avoid clogs. It has numerous features and components that you will find really useful, too. These include the Teflon tape, comfort regulator, 60-inch hose, washers, wand, wand holder, and installation instructions. 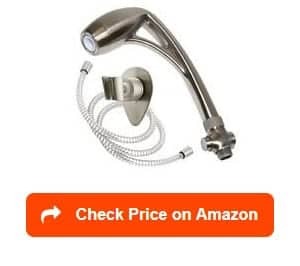 Offered at a reasonable price, this certain shower head may be what you need to have a consistently wonderful showering experience in your RV. If you want an RV handheld showerhead, which can fulfill its promise of delivering a high water pressure, then this product from PIH is for you. 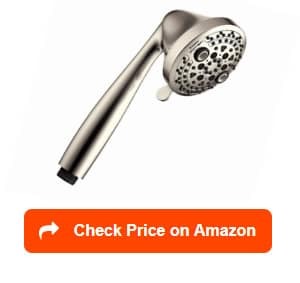 It is a multifunctional shower head in the sense that you can choose from its multiple settings, including the pulsing massage, powerful shooting, and trickle or shut-off. 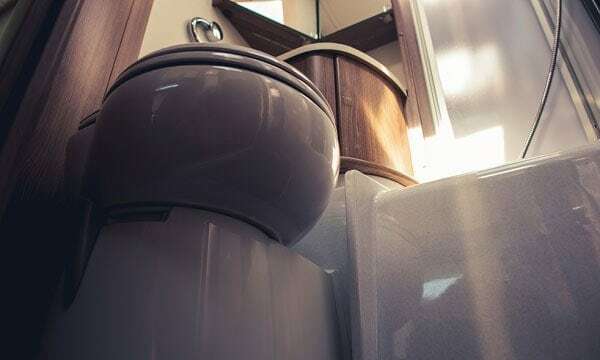 It has a somewhat elegant and upgraded design, which also works in a way that RV users can conserve water. It is mainly because it is highly efficient for pressurizing output. This showerhead also boasts of its impressive water flow. It features high spray or air volumes, too. It can deliver an intensified pressure upon release. You can also see its on/off trickle valve, which works in putting limitations on the water flow. You will also be pleased to know that it works with all regular fittings since it means that it will not let you deal with any compatibility issues. One more positive point is its upgraded 2xp turbocharging, which can be expected to work based on a water conservation principle. Plenty of features and functions are also available in this product including the 59-inch hose, hose clock, Teflon tape, and bracket. You can also check out this handheld showerhead & hose replacement kit offered by Dura Faucet. It is an elegant-looking product, which serves as an ideal replacement for an RV, camper, travel trailer, or motorhome. It aids in making your home on the road even more convenient to stay in. 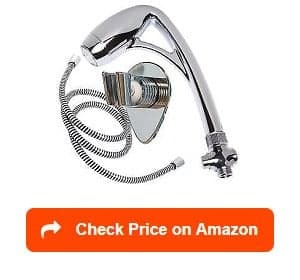 It is known for focusing on just a single function as a handheld showerhead. It also boasts of the inclusions of a wand and a hose made of stainless steel on its kit. Aside from that, you will find it complete with other important accessories and installation hardware, including the house guide ring and the wall bracket. You can also view this product as one of the right RV shower head options with the ease associated with fitting it to standard RV faucets. You do not need to think about it causing compatibility issues. Another impressive feature is the flow control trickle valve, which you can just switch on when necessary. Also, you will never experience problems associated with installation as you can easily put together the brackets and the shower nozzle. 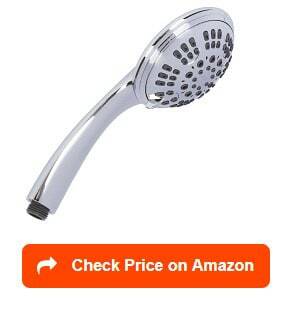 It works perfectly as an RV shower head, which is why it continues to gain good review. You can also find a premium showerhead kit for RV and marine use in Camco. Camco 43760 is a good choice as it can offer you a great showering experience. It boasts of its swiveling shower head and pivoting wall mount, which makes it possible for you to point the water flow wherever necessary. If you are searching for an RV shower head with on/off switch, then this one from Camco is also guaranteed to satisfy you. It is mainly because it features a handy and user-friendly on/off switch, giving you the chance of pausing or stopping the water flow once you start shampooing. With that, you can definitely conserve water. You will also find this offering from Camco impressive with its multiple spray patterns. In fact, you can choose from a gentle massage or a strong pressure. The installation process is also a breeze as it is equipped with connectors. You will also find its reinforced construction impressive as it lowers the chance of hose kinking. Other features that form part of the kit from Camco that you will surely find valuable are the 60-inch shower hose, wall mount, hardware, and washers. With its heavy-duty construction, you can also use it for many years. The DF-SA400-BQ Handheld Shower Wand from Dura Faucet will not also let you down if what you are searching for is that which is perfect for your recreational vehicle. The fact that this product is offered by Dura Faucet, one of the leading manufacturers of shower heads and faucets for RVs, can assure buyers that it is a quality product. The shower head focuses on a single function, which eliminates confusion once you begin using it. It also boasts of its flow control switch. You’ll find it useful in gaining full control over the water flow, giving you a kind of experience, which you really prefer. You can also use the safety trickle valve in case you want to conserve water. 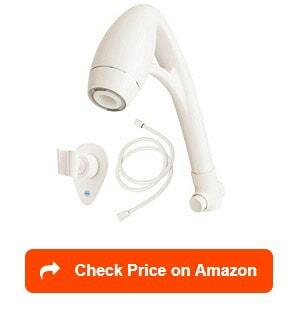 Another benefit of this handheld shower head is that linked to its compatibility with standard shower hoses. There is no need for you to worry about whether or not it fits your shower hose as it always fits the standard. It also boasts of its elegant look. In fact, you have a wide range of options for its finish, including the brushed satin, bisque parchment, white, chrome, and Venetian bronze. It can also withstand years of use as it is constructed from a heavy-duty material. One of the nicest features associated with the Camco 43712 Shower Head is its guaranteed ergonomic design. This handheld shower is ergonomically designed, giving you the convenience of using it for a long time. It is equipped with an on/off switch, which comes handy if you want to lessen the amount of water you consume every time you shower. It is because such switch makes it possible for you to pause or turn off water flow in case you are shampooing or applying soap to your body. It has 5 spray patterns, too – all of which give you full control over the kind of showering experience that you would like to encounter. For instance, you can set the pattern to a gentle and soothing massage. Installing it is not also a problem as the whole process is smooth-sailing. As for cleaning, you will also find the entire process easy as the spray tips present in it are constructed out of rubber material. Turning the shower on and off is also easy. You can do that without having to worry about any change in water temperature or wasting hot water. Another fully functional handheld shower head is the 6-function handheld design offered by Aqua Elegante. It takes pride in its amazingly high pressure as well as its fully adjustable nature. Apart from that, it is constructed out of heavy-duty and sturdy ABS plastic material. Just like stainless steel, such material is known for being rustproof. With that quality, you are allowed to use it almost anywhere, including outdoors, like the outside pool and beach. It is also perfect for recreational vehicle owners, like you, who want to invest in a really functional and convenient shower head. It is also greatly possible for you to enjoy the removable restrictor featured in this product. Such feature works in raking out the low flow limiter with an aim of boosting water pressure. With that, you have the opportunity of enjoying a showering experience that is often only provided in spas. One more thing that is so amazing about it is its six different functions or settings. With that several options, you have the opportunity of picking what you really want to enjoy. These six settings/functions are the saturating power blast, water saving, gentle rain, pulsating massage, and the two mixed settings. You will also find the self-cleaning nozzles integrated into the product helpful in lessening the build-up of natural calcium, which also aids in preventing and solving hard water eventually. Installing the shower head is also easy as you can do it yourself. It does not require the help of a plumber. Another highly recommended product in the RV handheld showerhead category is the Oxygenics Fury RV Shower Head/Fury RV Handheld Shower (Oxygenics 92481). It actually comes in a form of a kit, which is composed of almost all the things that are necessary for enjoying a great shower experience each time you stay in your RV. Aside from the shower head itself, the kit also features the non-slip rubber grip, which makes it easier for you to handle the product. It also features a flow control lever, which you can actually operate with the aid of your thumb. This lever is useful in minimizing the water flow into a trickle in case you are still lathering up or shampooing. It is also known to function without the risk of clogging unlike other products in this industry. With the kind of relaxation you will experience from this product, it is no longer surprising if you study the topics relevant to Oxygenics Fury vs. Body Spa as the shower head can actually offer a spa-like experience. It also makes use of the patented engine unique to the brand as its source of power. It does so by infusing water with oxygen. With that infusion, it is possible to expand each drop of water, thereby increasing its power based on the 5 settings it can provide. Such makes it possible for you to enjoy a relaxing showering experience while still ensuring that you conserve water. Other features that you will find in the kit are the wall bracket, which comes with the peel and stick tape, and the 72-inch hose. 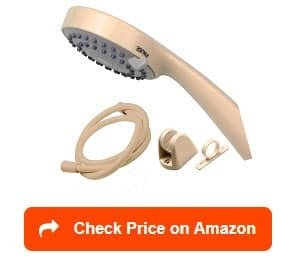 The PF276015 Handheld Shower from Phoenix USA is also a highly recommended product for those searching for a shower head that is mainly designed for recreational vehicle use. It comes in a handheld design, which promotes convenience once install it in your RV and start using it. Since it only has a single function, it can also eliminate the guesswork as far as using it is concerned. It is also equipped with a handy on or off feature, promoting ease in turning it on once you’re ready to use it and off at the time you are already finished using. You will also find the trickle shutoff feature a big advantage. One more thing that can assure you that it is a good product to buy is that it is made by Phoenix, a leading manufacturer in the home, marine, and RV markets. The overall construction is also lead-free, making it safe. The great water pressure it supplies is also a bonus. This is the last product that we will recommend in this review. Note that despite being placed last, it does not necessarily mean that it is lacking in terms of features and value. In fact, it also has several nice features designed to give satisfaction to its potential buyers and users. One of these is the 5-spray settings integrated into the unit. With these 5 settings and functions, you are assured that it is capable of giving you full control over what kind of showering experience you will get. It also features a very convenient and user-friendly handheld design. It has a modern style, too, which is perfect for different kinds of recreational vehicles. In addition, it has a brushed nickel finish, which is really nice to look at. Note that the attractiveness of this unit does not compromise its sturdiness and quality. It delivers a good water pressure, too, which allows it to leave a good impression to its buyers and users. Shut-off valve – This can also be in the form of an on/off switch. You need this feature because it helps in conserving water. Having this valve or switch also promotes utmost convenience, especially if you are bathing a dog or your kids. It offers convenience in case you wish to minimize the flow of water while lathering up without having to shut off the shower completely to avoid losing the temperature of water. Hose – One thing that should form part of a showerhead is the hose. Fortunately, the majority of shower heads for RVs today already include their own hose. The hose’s length usually ranges from 60 to 70 inches. Make sure that you thoroughly check the hose for its flexibility and durability. The flow of water – You should not also fail to check the water flow of the shower head, which is often measured in gallons per minute. Keep in mind that the consumption of water in an RV is often limited. This is the reason why you should take into full consideration the number of gallons per minute your shower uses. If a showerhead has a higher GPM, then it will most likely consume a lot of water, causing it to run out faster. Stay away from shower heads with a more than 2.0 GPM. Anti-clog feature – The RV shower head should also have an anti-clog feature. It will prevent limescale from accumulating on it, causing it to get clogged after just a few months. In this case, it would be best to choose one with a rubber surface since you can easily wipe it clean while being non-sticky. Adjustable spray – This is a vital feature as having various spray settings make it possible for you to enjoy a wide range of choices based on your needs. A lot of shower heads boast of at least three spray settings. The settings range from a slow drip to a slow massage. You can set your shower head into a slow drip if you wish to conserve water. It is because it allows you to switch it on while lathering. As its name suggests, an RV shower head refers to a handheld unit, which is useful in meeting your showering needs within your recreational vehicle. In most cases, the shower head needs to be connected into a flexible hose, which can be linked to a conventional plumbing setup. What is good about having an RV shower head is that it can provide users with enough versatility and flexibility when it is already time to shower inside their recreational vehicle. It is so flexible in the sense that it can give users a more convenient experience while showering. If you are looking for the perfect shower head for your recreational vehicle then take note that the best models often come with spray patterns and adjustable pressures. These specific features are usually present in the traditional units. With these features, you can rinse all nooks and crannies of your body without positioning yourself awkwardly and uncomfortably. Another advantage of this product is that it is usually designed in a way that it can save water. It does so while ensuring that the spray flows at an optimal rate. Shower heads also often come with the most flexible hoses. They are flexible enough that you will never have a difficult time manipulating it. You do not also have to worry about filling the shower space with too much hose. With such information, it is safe to say that the best shower heads designed for RVs can provide you with a truly nice shower. An RV shower head works quite similarly to the ones you find in household bathrooms. It typically consumes less water in comparison to conventional shower heads. You can expect it to work with the help of its pressurized nature. Since the shower head is pressurized, it is possible for it to provide you with the same clean feeling while ensuring that you do not use an excessive amount of water. Some brands and models are categorized as high pressure while still ensuring that the flow is not too much. One of the most common features in shower heads integrated into RVs is the shut-off valve. It works effectively in conserving water. It is mainly because this feature makes it easier and simpler to hit a valve than having to completely turn the water either on or off. In most cases, these shower heads also appear in the form of wands, instead of the fixed versions. This makes it easier for you to use your unit in reaching and rinsing all your body parts quickly. Most shower heads are designed in such a way that they work effectively in supplying an adequate flow, making it possible to rinse your body thoroughly while ensuring that you still save water. You can also expect these units to be capable of altering the pressure, thereby suiting your showering requirements and preferences. Wall Mount – The wall mount shower head is one of the most common choices of RV owners. It is cost-effective, making it an ideal choice if you are searching for a product, which is not only easy to use but also requires the least maintenance. What is good about the wall mount unit is that it usually offers several spray options. With such options, you can expect this unit to provide you with various styles guaranteed to suit your needs as well as the showering preferences of those whom you are constantly with during your camping adventures. Another thing that you have to keep in mind regarding this shower head is that you need to fix it to the wall permanently. This setup might be a drawback as it may cause inconvenience if you prefer to use removable shower heads. Handheld – You can also choose to invest in handheld showerheads. It is a better option for those who do not prefer to use the fixed type. Instead of mounting it to the wall directly, the handheld type is attached to a hose. This is beneficial as it promotes ease in removing and manipulating the shower head. Since you can easily manipulate it, you can spray even those difficult to reach areas. You also have an assurance that you get to rinse those parts where soap usually clings to thoroughly. You will also find this shower head handy during those times when you need to wash your shower. In addition, it will not cause problems when used by your short and tall family members. It is even possible to use it in bathing children and cleaning your pet easily. Body Spray – This is an excellent choice if you do not prefer holding a handheld unit just to receive the best clean. In this case, a body spray showerhead can help. You can install it by mounting it to the wall at various body levels. It creates a spa-like feeling. All you have to do is to spray it in several directions and clean a few body parts simultaneously. What is good about this option is that it gives you the chance to install various body spray heads, thereby ensuring that your experience is customizable based on your liking. Rain System – Another type of shower head that you can install in your recreational vehicle is the rain system. This type provides a steady and constant flow of water from above you directly. It also supplies you with light water pressure using a huge diameter, which is helpful in making the flow of water even. This lets you enjoy the shower without having to move or squirm a lot. This type of shower head requires you to use an extended shower handle, so you get the chance to stand directly below it and have a more enjoyable experience when showering. Such an enjoyable shower can be experienced without moving too much. Even without excessive movements, it is still possible for you to expose all parts of your body to the water. Ceiling Mount – This type is an excellent and luxurious choice for those who prefer pampering themselves while having enough funds to ensure that the bathroom in their recreational vehicle continues to look trendy. The ceiling mount unit is designed in such a way that you need to fix it in the ceiling. Such a setup is necessary for supplying an even water flow. However, take note that it needs special plumbing that might increase the total cost of installation. Helps in conserving water and energy – Aside from being both calming and relaxing, it is also possible for the best one to help you in saving both water and energy. Note that due to the relaxing nature of taking a shower, you might want to spend a lot of time there. However, this might also mean that your average 5-minute shower may cause you to consume around 15 to 25 gallons of water. This is equivalent to approximately 40 gallons in just 10 minutes. With the help of a good shower head, you can enjoy showering without wasting too much water and energy. You can expect these modern units to conserve a higher amount of water than a pipe with an average size that works non-stop for a similar period of time. With that in mind, it is possible for it to conserve at least 30 to 40 percent of water. 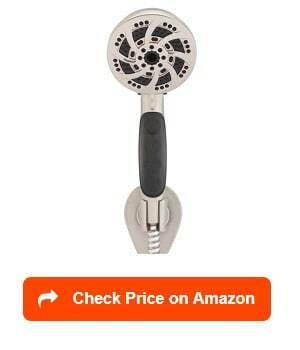 Another great thing about this shower head is that it reduces the speed of water while evenly spreading it out. It also lets you save on energy since the ability of the shower head to lessen your use of water indicates that you will also need less water in pumping it into your overhead tank. User-friendly – Another thing that makes a shower head so beneficial is its user-friendliness. You can easily use it. It offers utmost comfort and convenience plus it prevents you from having to spend too much time figuring out how it works exactly. Most shower heads today also come with simple designs, thereby promoting ease when it comes to installing them. Cleanses all parts of your body – It is even possible for your chosen shower head to reach even those parts that are difficult to reach. With that, you will no longer struggle when rinsing the thick conditioner or shampoo from your hair. This especially holds true if you get the handheld type. It is mainly because it can rinse your body quickly and completely. You will not have difficulty washing your body as you just need to bring the unit near your head then guide it to the specific place you prefer to guarantee a smooth rinse. Highly Versatile – The versatility of the majority of showerheads today is also unquestionable. Some units, especially those that fall under the handheld category, can be utilized either as a mounted or a detachable shower head. It is possible for you to use some of these units for extended reach whenever necessary then reattach them so you can use your two hands if needed. Converts chlorinated and hard water – Another remarkable advantage of a high-quality shower head designed for RVs is that some of them feature a filter or extra fitting. Such a feature can further improve your bathing experience. It can make your experience safer and better. You can find some modern units that have built-in water filters that work in arresting the water flow from falling directly to your head as well as your other body parts. These filters can also convert too chlorinated or hard water into something that is safe for you. This will prevent harmful bacteria and chemicals from getting in your body. Offers a therapeutic experience – Aside from giving you a relaxing and rejuvenating experience, some modern shower heads also have the ability to swivel to 360 degrees. This allows the water to fall slowly, which does not only rinse your body but also massages it. It promotes a complete therapeutic experience. What are good RV shower head brands? The shower head business is quite competitive, which is the primary reason why you can find several brands competing in this industry. 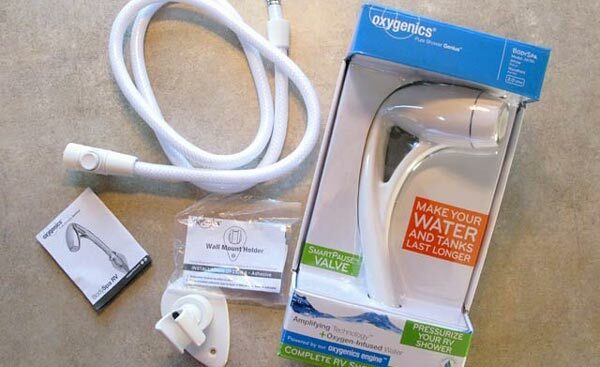 One popular shower head brand is Oxygenics. This specific brand is popular for its use of the Oxygenics technology, which is its trademark. Such technology can help in boosting the current water pressure. Other famous and reliable shower head brands are Dura Faucet, Camco, ETL, and Aqua Elegante – all of which are mainly focused on supplying high-quality products. Do RV shower heads save water? The answer is yes. It is mainly because these products can provide good water pressure. When rinsing your body, you will surely consume less water at less time due to its pressure. It can even give you a good cleanse. Aside from saving water, a good shower head also helps you save money. Note that the average shower often takes around eight minutes. A regular shower, which does not have a saving feature, will usually consume 3.8 gallons of water every minute. With a shower head, you can lessen the amount of water you use, which is also the key to saving money. This is actually a holy grail in dry camping. It is mainly because you have limited water supplies in this case. By allowing you to save water, a high-quality shower head serves as a lifesaver as it supplies reasonable water pressure. Handheld vs. regular shower heads: which one is better for you? The handheld showerhead is actually better than a regular unit as the latter is quite impractical when used in an RV. Note that the regular shower head is not that practical regardless of how well you can adjust its angle. A handheld showerhead is more beneficial because it functions similarly to the regular one while still offering other features that are not present in the latter. One thing that makes the handheld unit more favorable than the regular one is that it is less strenuous to use. With a handheld showerhead, you no longer have to move your body around so the flow and streams of water will reach various parts of your body. You can just pull it down to bring the streams to you. 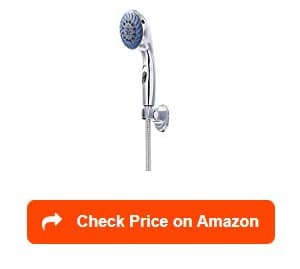 This shower head is also versatile as you can use it for a number of purposes. Aside from showering, you can also use it in washing your pets and cleaning the bathroom. These are usually some of the things that you can’t do using a regular shower head since it is often fixed at a specific height. The versatility of the handheld showerhead makes it a better option for RV owners. It can surely give you a more comfortable camping experience. Can you use a regular shower head in an RV? Yes, it is possible to use a regular shower head in your unit. However, it would still be better to go for the other types, especially the handheld units. It is primarily because the other types have more capabilities and features than the regular one. Your experience in your recreational vehicle will become even more enjoyable by choosing a better type of shower head. How to install (replace) RV shower head? Installing or replacing your RV shower head is not that difficult. All it takes is to familiarize yourself about the steps associated with the whole installation and replacement process. The first step is to familiarize yourself about the access points of your shower faucet. If you can’t find them, make it a point to check the manual. Such can guide you in the right direction. Once you find the access points, the next thing that you should do is to turn off the supply of water. The next thing to do is to drill some holes. In most cases, though, you can use the existing holes in a shower stall once you take out your old shower head. As an alternative, you can utilize the double-sided tape usually provided in a kit. This will prevent you from having to drill holes. If there are rubber O-rings, then ensure that you put it at the end of the hose to prevent severe leaks. For clearer instructions, it would be best to consult the manual of your chosen unit. Remember that shower heads are not created equal, so you need to check the diagrams and manual included in your chosen product. Why do my RV shower head leak? 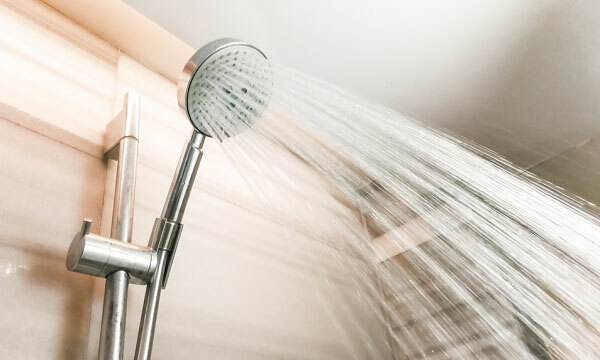 A leaking shower head is often caused by three common factors. One possible cause is aging. As your chosen unit ages, there is a great possibility that it will leak. Such leakage indicates that you might need to install a new one. Another possible reason is a crack that has developed in the unit. You can detect the crack by running the water slowly through the shower head then letting a light shine through it. It might also be necessary to take the unit out of the shower so you can inspect the inner parts of it thoroughly. Such can help you determine the exact spot of the leak. Your shower head might also leak due to faulty or poor installation. Note that in most cases, installing the shower head requires you to use a plumber’s tape as a means of forming a bond between the pipe and the unit. The tape helps in preventing the water from leaking or spilling back. You will find it extremely useful in installing it. In case you noticed that the leak comes from the specific place where you attached the shower head, make it a point to remove the unit as well as the white tape covering the thread. Look for a new white plumber’s tape to replace the old one. After replacing it, you can reattach the shower head. This will most likely fix the leak brought on by a poor or faulty installation. What does the GPM or PSI in RV shower heads mean? GPM means gallons per minute. This indicates the water flow of the shower head. Note that the majority of RVs have limited water, so it is necessary to check the GPM of the unit you wish to buy. Note that a higher GPM indicates that the shower head uses more water, leading to a faster consumption of water. If possible, stay away from shower heads with a GPM of more than 2.0. How do you clean and unclog an RV shower head? To ensure that your RV shower head continues to function in the best way possible, you need to clean and unclog it regularly. What you have to do is to look for a strong plastic bag, which is big enough that it can fit around your shower head. The next thing to do is to mix one cup of white vinegar and one-third cup of baking soda in the bag. You can expect the baking soda to react with the white vinegar, which might cause it to bubble, so it would be best to mix the two in the sink. Mixing the two mentioned ingredients can create a strong cleaning solution as the acid present in vinegar can be expected to react well with the sodium bicarbonate present in baking soda. The next step is to use a rubber band to secure the plastic bag over the shower head. Ensure that you completely cover it with the solution. You should then let the plastic bag stay in the unit overnight. Use water to remove the solution from the shower head the next morning. Once done, you can use it for showering again. However, make sure to allow the water to run for around a minute or so prior to stepping beneath it. This can give you a more revitalized shower pressure considering the fact that the shower head is already clean and free of any clog. An RV shower is indeed one of the things that promote self-sufficiency during your time on the road and each time you decide to camp out. 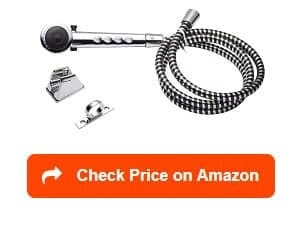 That is why you also have to invest in the best RV shower head that is most appropriate for your needs to give you a really wonderful experience each time you stay in your RV. Find out which one among the mentioned shower heads here can give you your desired level of control as far as water and pressure and concerned. With that, you can definitely consider your vehicle as your second home with all the modern conveniences that are on-board. We would like to thank you for reading this article. Find out more about how to choose the best RV water pumps, best RV water softeners, best RV tankless water heaters and best RV water pressure regulators with our reviews and ratings. Furthermore, please take a look at the best RV water hoses, best RV water filters and best RV surge protectors, to choose the best one for your RV freshwater systems. What’s up Dear, are you really visiting this website regularly, if so afterward you will definitely get nice knowledge.